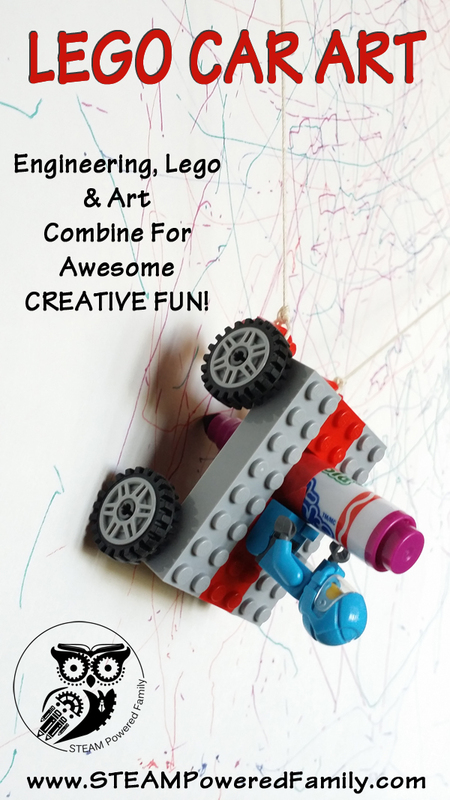 Lego Car Art - Lego, Engineering and Art Combine for Creative FUN on a Vertical Surface! My boys are not big on drawing and I often struggle to get them to embrace their inner artists. 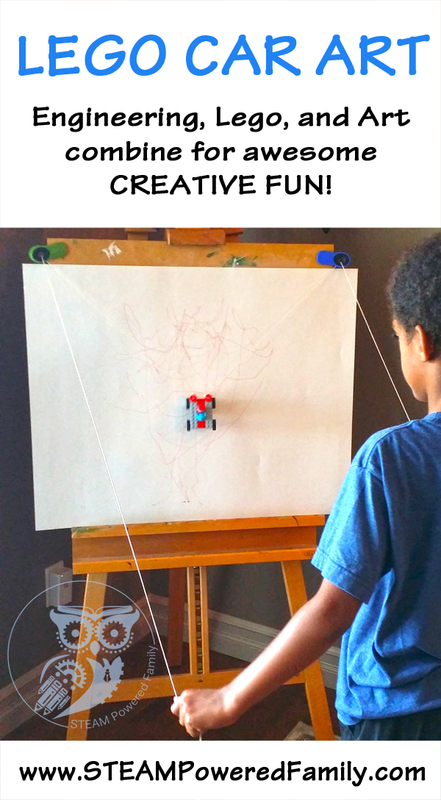 But add in a lego car and some strings to drive it up a wall and suddenly drawing is super cool! 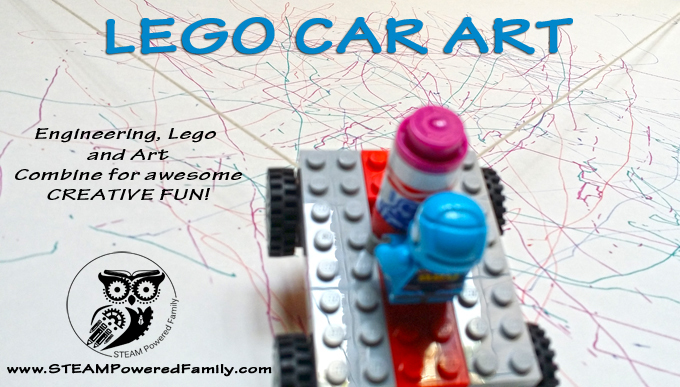 Lego car art combines engineering, Lego and art for fun that is irresistible to even the most reluctant artist! Keeping the A in STEAM! Disclaimer: This post uses affiliate links. At no cost to you, if you purchase after clicking on one of my links I get a small commission. 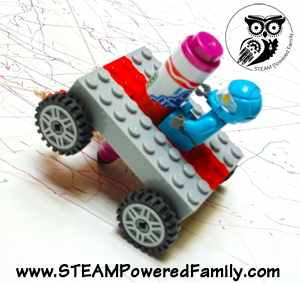 Thank you in advance for your support of STEAM Powered Family. To accomplish this feat took a bit of engineering and trial and error. 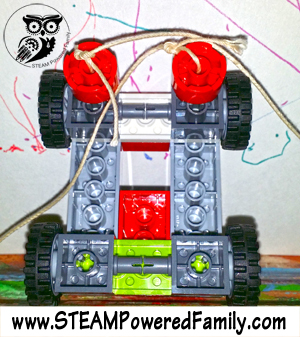 First we constructed the car with pieces from our Creative Lego Box. It’s a simple design, essentially a rectangle with cross bars that we attached the axles of the wheels to. Then we added our Lego man on his seat, making sure to leave a 4×4 gap. This is the space for the marker. Then we added the circle pieces with the hole in the middle. These became our hitch points for our strings. We found it took a bit of experimenting to find the right balance and angle to place these hitch points. We tried placing them on the top at the front. Then on the sides, both top and bottom, but we found that for the angles we were working at, at the front on the bottom worked the best and caused the least amount of “spin outs”. Our wall was our much loved easel. And the feed points for the string were clips that were sturdy enough to handle the pull of the strings. They worked perfectly! I made handles for the strings (tied the string around a 2×8 brick) but the boys preferred to hold the strings and ignored the handles so I took them off. We used Pipsqueaks markers which are shorter and worked better for maintaining the balance of the car as it moved about. I added a layer of tape just to get a really snug fit. I’m not sure it was really necessary, especially once the boys got the hang of manipulating the car with the strings, but if you have younger kids the snug fit is helpful. 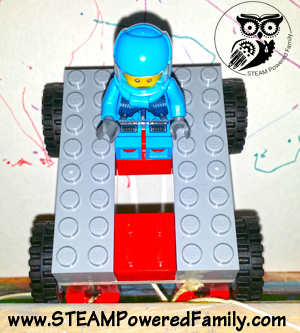 In the end our Lego man drove his little car around leaving all sorts of great designs. I used a large piece of card stock so the boys had lots of room to cruise around. The boys both had so much fun and it was great to see how they had to really slow down and take their time. If they moved too quickly the car would “spin out” and come off the wall. Or if they pulled too hard the hitch points would pop off the car. Slow and steady was the name of the game. I’m planning on leaving it up for a while so the boys can practice, it’s not easy. There is a lot of technique and skill required to get that Lego man to drive where you want him to go. 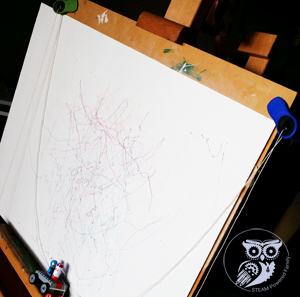 Our OT suggested that core work and vertical surface work would really help my boys with their fine motor skills and although this is a little different, I think there are a lot of benefits to them mastering this type of skill. To do a little extra vertical work I had Preston hold the car in his hand and drive it around a bit too. I had him do this with both hands so he could work both sides of his body and develop some skills that are a struggle for him. As both boys get better at this, I might started giving them challenges like trying to write letters or shapes, or turn it into a game where they need to traverse a maze. For now though they are having fun creating and being ARTISTS and that is a beautiful thing! We never want to forget the A in STEAM! This is brilliant! I think my kids would have so much fun. They love LEGO. This is awesome! My boys are huge Lego fans. Thanks for sharing at Made for Kids! Love this – think we may need to get an easel. Now where on earth to put?